Molenvliet Wine Estate is a wonderfully versatile function venue, especially when it comes to weddings. Apart from the main wedding venue, which is a perfect blank canvas for wedding planners to work their magic, the rolling lawns offer an ideal place for the ceremony while the vineyards are great for pre-drinks and canapés. Then there’s the wooden veranda that runs the length of wedding venue – an alternative setting for a summer wedding banquet. The Events Draping Co. team worked with wonderful wedding planners Nu Experiences to drape part of the reception venue in white to make it more intimate. 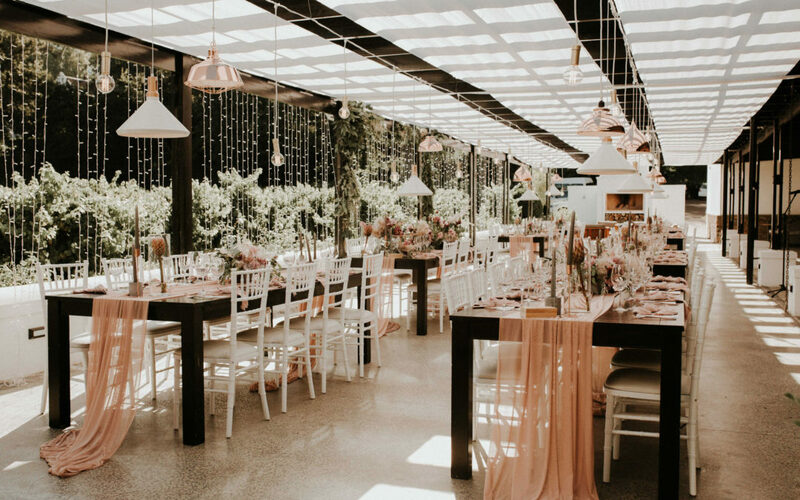 They also draped three strips along the wooden beams that span the veranda, creating shade and ambience for the wedding guests while they enjoyed the celebrations. The décor, lighting, flowers and furniture all came together superbly with Baie Goeters, Bouwer Flowers and Happinest Weddings. Stunning photographs by Grace Charlotte.